On November 21, 2003 Dean Michael Alfano officially dedicated a wing of New York University Dental College as the Dr. Larry Rosenthal Institute for Aesthetic Dentistry. Named in honor of its principle benefactor, the Rosenthal Institute is wholly dedicated to fostering continuing education, research and patient care in current and emerging techniques in aesthetic dentistry. The institute also houses NYUCD’S continuing education program, which annually attracts more than 4,000 dentists from more than 20 countries, making it perhaps the most far reaching program of its kind in the world. Dr. Rosenthal’s vision and generosity have helped to create a cadre of aesthetic dentists who can make aesthetic dental services more broadly available to the general public. It is the nation’s first comprehensive program in an academic dental center to train dentists in the burgeoning field of aesthetic dentistry. The 6,000,000.00 8,500 Square foot learning facility features an elegant marble and mahogany décor. It is equipped with 15 state of the art treatment rooms all equipped with state of the art ambidextrous capable Kavo dental chairs, a 52-seat amphitheater with lap top connection, surround sound system and global videoconferencing reach. It also has a corporate style boardroom with remote broadcast capabilities a large laboratory with a demonstration area and overhead state-of-the-art TV display and an operatory under glass outfitted with multiple cameras to permit live interactive clinical demonstration that can be broadcasted around the world. The Rosenthal Institute will provide a coordinated approach to the study of aesthetic dentistry. Students will develop skills in current and emerging techniques in aesthetic dentistry. If you are interested in learning more about the Rosenthal Institute, contact Aesthetic Advantage at 212-794-3552 to register today! Or visit www.aestheticadvantage.com for additional information. 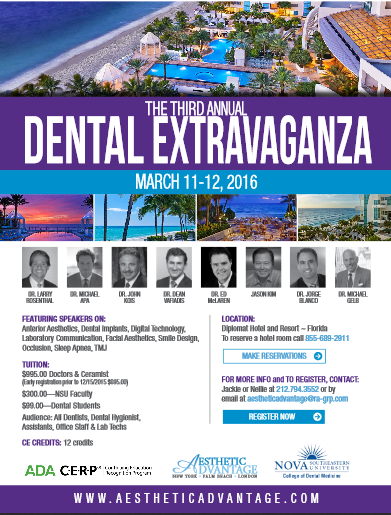 Our Third Annual Dental Extravaganza is around the corner, Mar Aesthetic Advantage along with Nova Southeastern University will be in Hollywood, FL at the Diplomat Hotel and Resort. To reserve a hotel room call 855-689-2911. Key Speakers include: Dr. Larry Rosenthal, Dr. Michael Apa, Dr. John Kois, Dr. Dean Vafiadis, Dr. Ed McLauren, Dr. Jorge Blanco, Dr. Michael Gelb and Jason Kim. In order to register please call 212-794-3552, or email aestheticadvantage@ra-grp.com for more information. There is a tuition cost of $995.00 for Doctors and Ceramist or an early enrollment cost of $695.00. Dental Students tuition cost is $99.00. 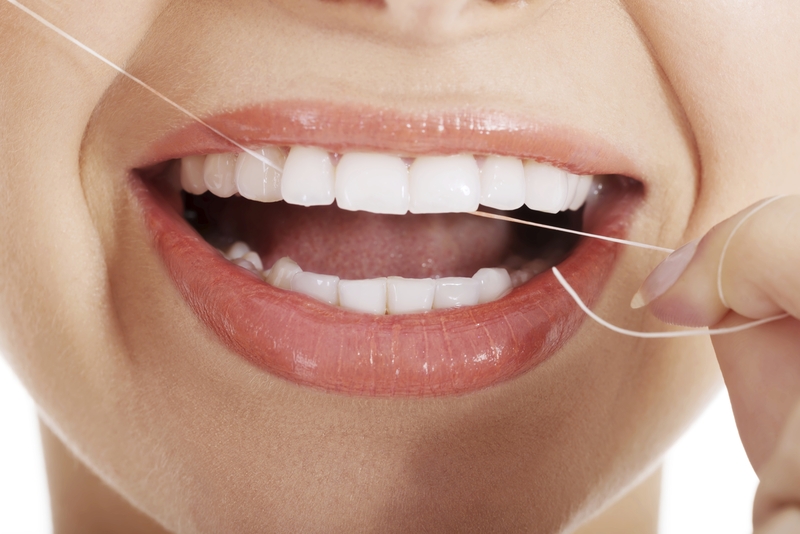 It’s a different approach of the way you look at your patients and how you do dentistry. We look forward to seeing at our Third Annual Dental Extravaganza!! Contact Aesthetic Advantage in New York, NY for enrollment information 212-794-3552 or visit our website at www.aestheticadvantage.com to learn more about our Third Annual Dental Extravaganza. 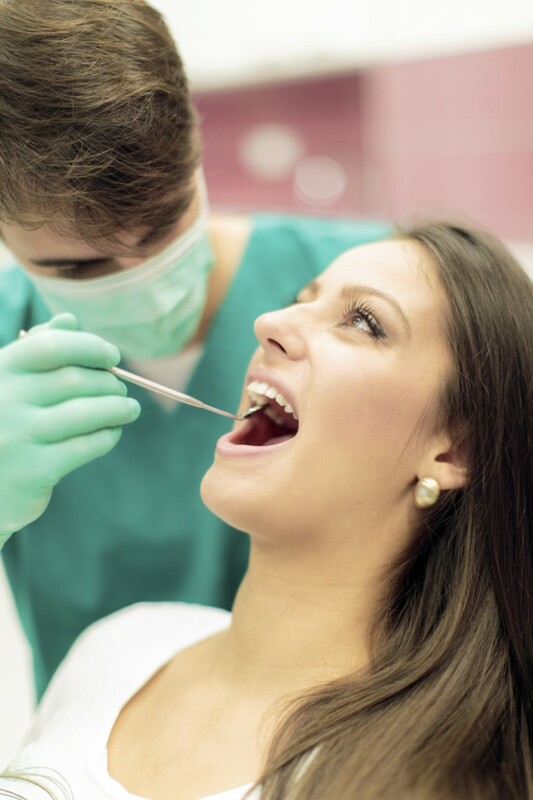 Continuing your career in dentistry after required education is over is important. When you take into consideration how the world of dentistry is constantly changing and growing over time, there is a clear reason to continue in dental education. On July 1, 2008, a continuing education requirement law was set into action in New York. This law stated that dentists had to complete 60 contact ours of continuing education in each three-year registration period. Continuing Dental Education is important due to the fact that we live in a constantly changing world. In the world of healthcare, new medications and procedures are always being developed, especially as technology also further develops. It is a healthcare professional’s job to be currently updated in all things under their field. Continuing education programs have evolved from strictly lecture-based formats to more hands-on and adult-learning centered formats. There are still many lecture-based programs, but there is a move toward more activity-based and hands-on learning. 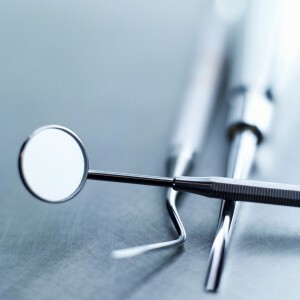 As the practice of dentistry and dental hygiene has evolved, hands-on courses delve into the real world of the profession while allowing practitioners to develop a feel or understanding of procedures or products before using them in practice. The Aesthetic Advantage Program is a five star comprehensive dental program that offers a long list of continuing dental courses catered towards those looking to further enhance their dental education. For more information about how to broaden your education with dental continuing education call Aesthetic Advantage in New York, NY at 212-794-3552 or visit www.aestheticadvantage.com. Aesthetic Advantage also proudly serves New York, Atlanta, Florida, Chicago, Pennsylvania, Boston, Rhode Island, California, North Carolina, South Carolina, and surrounding areas. For individuals pursuing their dreams in the field of medicine, there is an overwhelming amount of pressure placed upon their choices. The reality of the situation is that in any case of medicine, individuals’ lives are placed in hold of their practitioner. When looking at it in that case, it’s definitely important that dentists know there is always something to learn. Continuing education in the dental field is essential. Training procedures include the constantly changing world that we live in. As we advance technologically, there are constantly new innovative treatment methods and tools that professionals must grow accustomed to practicing or using in order to move forward. Here at Aesthetic Advantage, individuals are encouraged to continue their dental experience by furthering their understanding of the practice. Dental continuing education by the instructors from Aesthetic Advantage is a fantastic experience for individuals who love meeting new people, learning new things, and visiting great cities. The doctors of Aesthetic Advantage provide a wealth of information to their students and change the way individuals practice dentistry in new and innovative ways. Aesthetic Advantage is teaches a comprehensive curriculum that serves to challenge students in order to reach their true potential as doctors. If you are looking to continue you scope of education in the dental field, contact the professionals from Aesthetic Advantage. Your skills will not only expand, but your level of education will reach another level to benefit your practice and career. For more opportunities to experience dental courses or information on dental continuing education call Aesthetic Advantage in New York, New at 212-794-3552 or visit www.aestheticadvantage.com. Aesthetic Advantage proudly serves New York, Atlanta, Florida, Chicago, Pennsylvania, Boston, Rhode Island, California, North Caroline, South Carolina, and surrounding areas.